All push ups are not created equal. Anyone who has done push ups to fatigue can tell you that wrists, elbows, and shoulders can all experience some amount of pain from a standard push up or press up. The solution is a push up bar, which can take some of the load off of your joints, helping you to avoid injury and do more push ups. To help you pick the push up bar that’s right for you, we’ve reduced your choices to the top 5 best push up bars. These push up bars underwent extensive testing and investigation to make sure we can help you get the right push up bar. What is the point of a push-up bar? This push up bar is an adjustable, fixed handle board and handle combination. It comes with two handles that fit into different pegs on a board (also included), helping you know exactly which muscles you’re targeting with which hand placement. 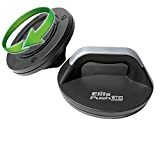 Because it tells you the angles you need to hit different muscles, this option is good if you are serious about getting a good workout from your push up bars. 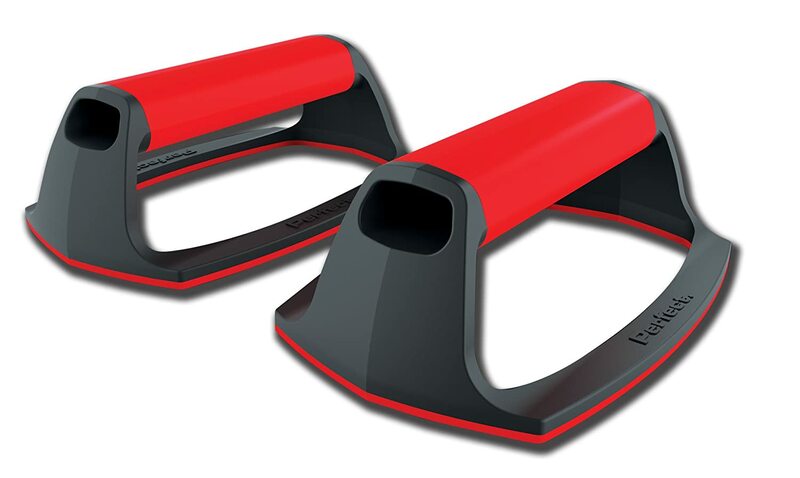 Unlike other push up bars, it does not rotate or move during the press up motion. Rather it allows you to change your hand positions between sessions of push ups. 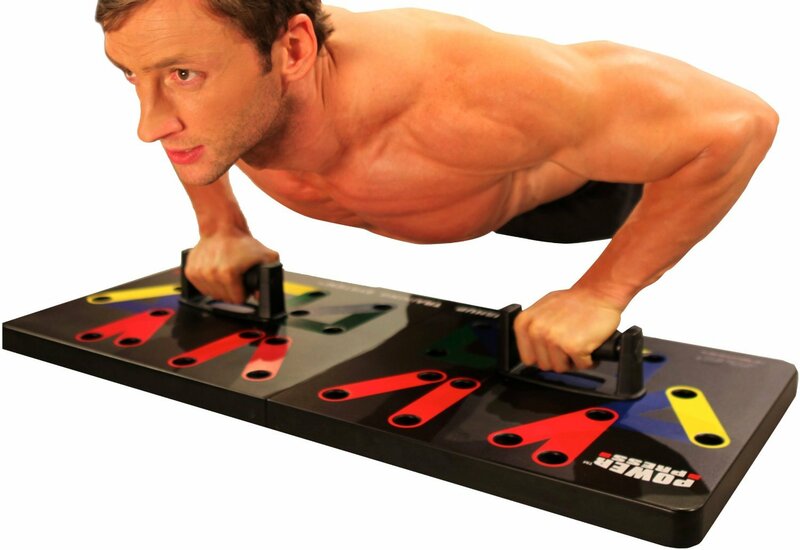 Reviewers like how the color-coded board for this push up bar makes it easier to actually use the push up bars, citing how in the past they would buy equipment and not use it. Others have noted that the board does not seem to work well for people over 200 lbs because the plastic feels flimsy when it’s under stress during a wide angle push up. It is the most expensive push up bar we reviewed, but also the most clear and varied in how it’s meant to be used. These push up bars come with two square-handled rotating bar. Rotating push up bars are good for those who want to activate as many muscles during one push up as possible. Note that this distributes the stress of the exercise across muscles, so you might not see as exaggerated results in one spot (the chest, for instance). Note also that the rotating system does require some balance. As you descend into a push up, it is a strange sensation to have to keep your hands in a set position or to move your hands as you go through a repetition. This is the lowest cost rotating push up bar we reviewed, and it comes with a bonus jump rope. Reviewers like the construction, noting that these bars feel sturdy. Others feel as if the handles could be more comfortable. This is another rotating push up bar but with a higher quality construction. The main difference is in the handles and materials used in the rotating mechanism. The handles for this bar have a dense rubber material shaped into a tapered, round handle. You may find this more comfortable than other square and plastic handles on the market. Its rotating mechanism uses steel ball bearings, making it smoother than others. Reviewers found that attempting a very wide push up with the Perfect Pushup Elite could lead to the bars slipping. In general, people like the feel of the bar’s handles. These push up stands are a fixed plastic bar with a rectangular base. The base being a rectangle, these feel more sturdy than other push up bars. Unlike other push up bars, though, these do not rotate or have a pegboard to guide where you place the bars. This might be a good push up bar if you know you want to get the benefit out of a press up bar but don’t need any guidance for hand placement or don’t need any rotation. Reviewers like the foam on the handle and bottom of the bars, which make it easier on the hands and floors. Others find it difficult to find a neutral position for their wrist using these bars. These are the least expensive and simplest push up bar we reviewed. This might be the bar for you if cost is a concern. 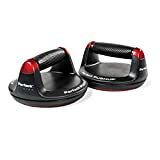 The CAP Barbell Push Up Bars are made of plastic and have a classic gymnastics “parallette” style construction, with a single bar connecting two perpendicular feet. 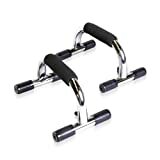 This style of push up bar is good if you are trying to exercise in a small space or while traveling. It is lightweight but sturdy enough to perform many different styles of push up that would be less effective otherwise. Some reviewers found the handles wobbly around the base of the handle, which could have something to do with their floors. You would not want to use these on a soft carpet. Others find no wobble in their product and that it works as advertized. A push up bar may seem counterintuitive. Why would you need a bar for a push up, when you can just put your hands on the floor? It’s a good question. Simply put, push ups are good exercise but they could be even better, and a simple push-up bar makes push ups more effective. With standard push ups or press ups, your arms tend to be in the same position for repetition after repetition, and your chest cannot go further than the floor. With a push up bar, you are able to easily change the position of your hands and your chest can go deeper than your hands. Not to mention, the bar shifts the load-bearing part of a push up into your palm rather than your wrist. With different positions for your hands and a deeper range of motion, you get more out of your push up. By changing the way your hands are positioned in a push up, you activate more muscles than you would otherwise. More muscles activated means your muscles and their proportions to each other will be more balanced. This is important for both the goal of improved looks and injury prevention. 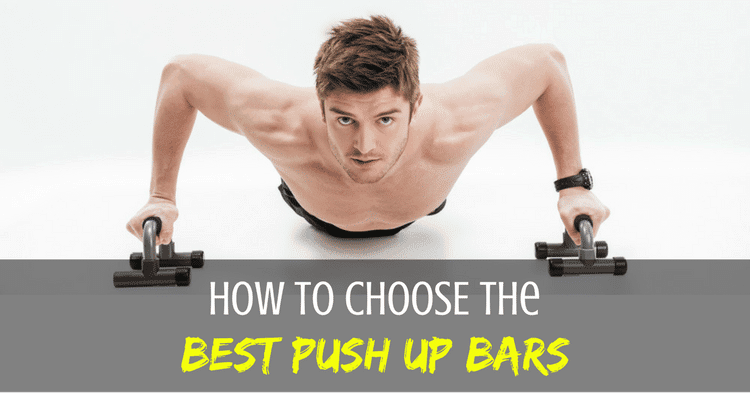 While they are certainly not necessary, many people would benefit from using a push up bar. Anyone who has sustained a wrist, shoulder, chest, or back injury could find that the different positions possible from a push up bar alleviate stress on that spot. 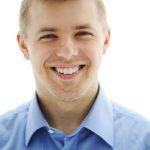 In fact, alleviating discomfort is one of the main reasons people get a push up bar. Specifically, bars make it easy to avoid wrist and shoulder discomfort. But beyond just the injury-minded, a push up bar would benefit the athlete, from amateur to expert. An athlete must constantly think of ways to protect themselves against injury, and the increased range of motion possible with a push up bar makes that possible. For the athletic-minded and those people who will be doing many push ups at a time, a push up bar helps distribute the effect of the pressing motion throughout the upper body. Overuse from always pressing in the same motion can lead to injury, and changing up the angle of activation helps you make sure you’re not fatiguing sensitive joints like shoulders, elbows, and wrists. Your goals with push ups is bound to be different from the injury-minded Army veteran’s or from the bodybuilder’s. They would do best to select a bar based on their needs, and so should you. What is your main reason for wanting a push up bar? How often do you plan to use this tool? Do you have any injuries you’re trying to avoid? If your issue is just needing to alleviate wrist pain, you have a lot of options. Any bar would help to that end. If you have a very specific set of hand placements that allow you to reduce stress on a particularly difficult and injury-prone joint, then you’re going to want to have a fixed-place push up bar so that you can have complete control of your push up’s range of motion. If you are going to use the press up bar for many more reps than the average person, you might want to spend more to get quality. Different people will have different results with each of these push up bars. Some may need to use caution around an old injury, while others will want to use these bars to increase muscle mass. In this review, the Elite Push Up Bars are the winner. 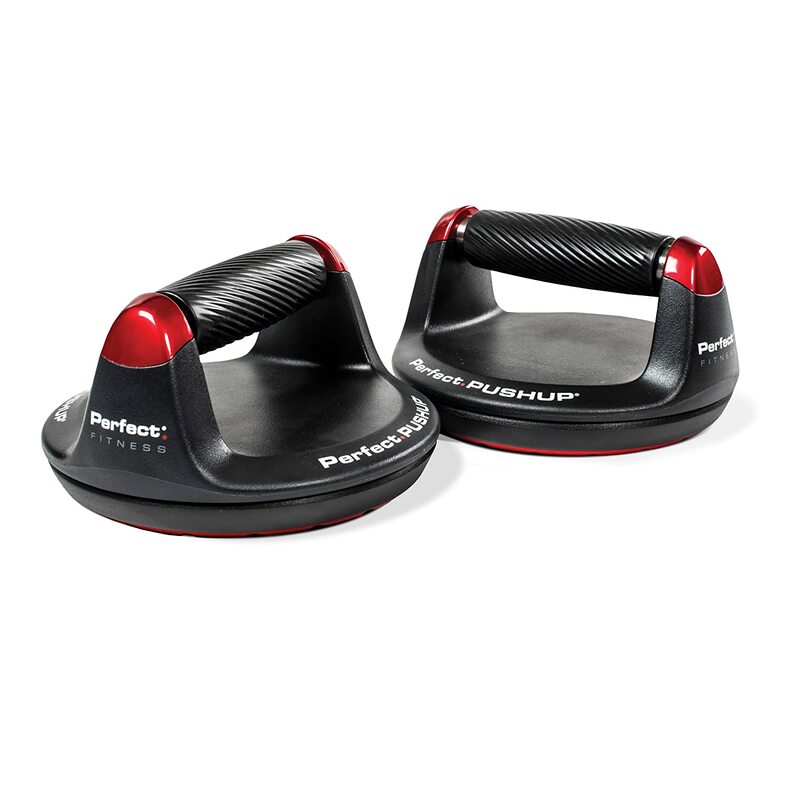 They are a rotating-style push up bar that can be used in a variety of positions to great effect. 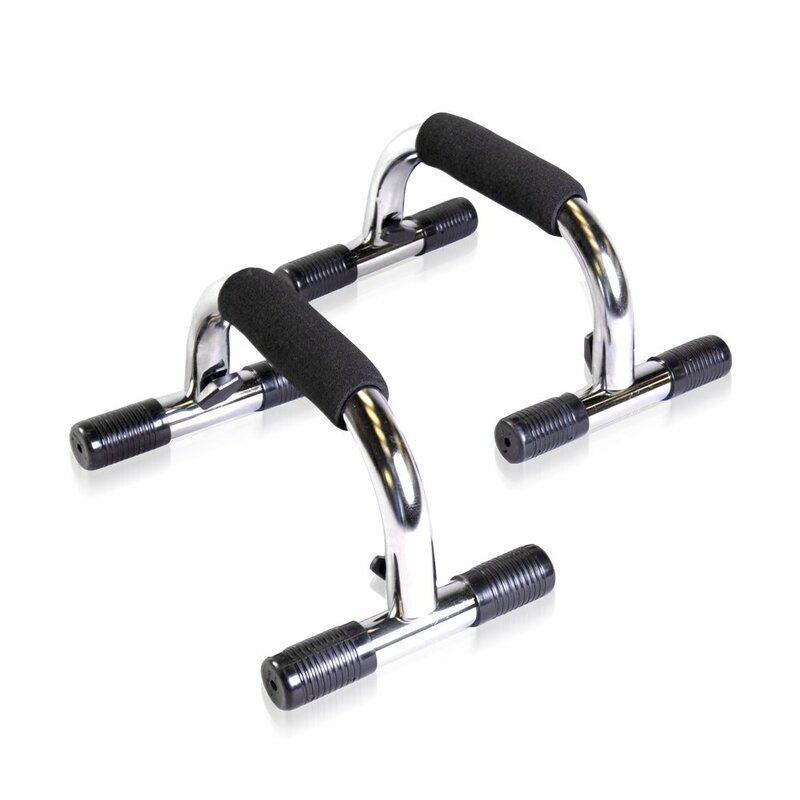 At the same time, they are lower cost than the other rotating push up bar but in fact feel like they could be comparable to the higher cost rotating bars in terms of quality.